Duties to Your Parents Essay. Welcome to our website. This is the one of the best and an unlimited the source of Essay and Paragraph. 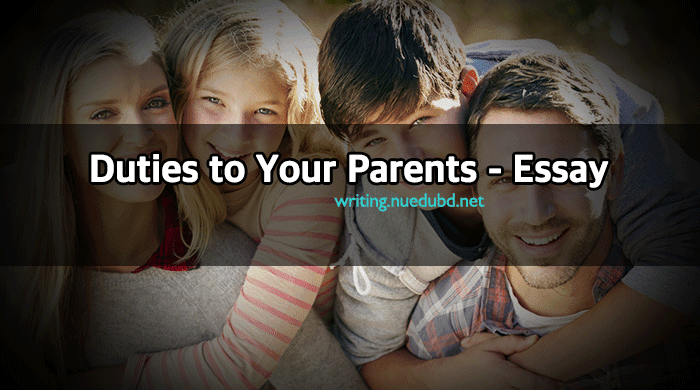 Now NU EDU BD writing section sharing the most useful Duties to Your Parents Short Essay for you. I hope you'll like it. Education is one of our basic rights. This is very short and easy essay for you. Now check this out the Short composition on Duties to Your Parents Essay for you. Children's relationships with their parents: Children Have a close affinity with their parents. They bring the children to the world. because of their hardships and pains, the children can enjoy the beauty, freshness, and essence of life. parents are the main sources of our life. thus we should be loyal to them we must perform duties for their well-being on earth. Parents contributions: Parents contribution to us are immense. Mother the keeps the child on her womb for 280 days. She breeds the child. When a human child is born, it is very helpless. The parents rear them. They take every care of the children. They do not seek the own happiness. The parents rear them. child up. They feed the children even themselves being unfed, They work for our own prosperity. They sacrifice themselves for the welfare of the children. thus the parent's contributions to the children are innumerable and indescribable. parents are our guides: parents are our guide, friend philosopher. They teach us the first knowledge. They lead us in the best way. They lay their moral teaching on us,.They even sacrifice their lives for the children. Thus duty to parents is our holiest responsibility. Duties of children: To obey our parents is our religious duty. They are our well-wishers. We must be grateful to them. We should work for their well-being and happiness. We should not act against their wishes. We have to go on the basis of their advice. we should not displease them. In old days, parents become weak and enfeeble. At that time, they need more and more attention. We must serve them in their woe and ow. Parents will be happy if they find that are cared for their children. Obedience leads to success: Obedience to parents leads to the satisfaction of God. in every religion there is the indication of man to obey parents. This obedience will be a success for us. If we can perform our proper duties to parent, we will be justified as the best creation. All great men of the world were obedient to their parents, we will be justified as the best creation All great men of the world were obedient proper duties to parents. Hazrat Mohammad (Sm.) says, '' Heaven lies at the feet of the mother. The Hindu religion asserts Father in heaven, father is religion, father is the best desired. Thus the obedience to parents is a must for everyone. Disobedience to parents: Disobedience to parents id the most heinous work It is a great sin. A disobedient child is not better than a filthy beast. God is displeased with him. He is never helped by God. He will be thrown into the deep pit of sufferings. In fact, Disobedience to parents will disparage us to a lower level. Conclusion: Every human being should be grateful to parents. We should work for our breeders. We should not deviate from this moral duty. We owe to them a lot. We can not repay what we owe to them. If we can work for the satisfaction of our parents, will find that their sacrifices and sufferings have been amply paid.